Hi you guys! Whilst I am having an insanely awesome time in Dubai, I am thrilled to have yet another incredibly gorgeous gal I am so lucky to have connected with online - Rachael - taking over the blog to share some of her crafty awesomeness with you. You are going to LOVE this. I'm must confess that I'm so flipping chuffed to be asked, by the one and only “Martha Mudguts” to do a guest post for her while she is away in Dubai. So much so, that it truthfully took me a little while to decide on what to craft for you all! Let's not dance around the giant sized vodka bottle just yet as they are indeed huge “crafting – shoes” to fill....however you do have my word, that I will give it my very best shot! I just luv that lady! Word - Lady Mudguts is my kind of gal and I think she is one of the best girly - blouses around! Wouldn't you agree? So, while Martha's off kicking her heels up in the desert, yes I mean that red sandy stuff and not crème brulee, let’s make “colourful cross bunting”. 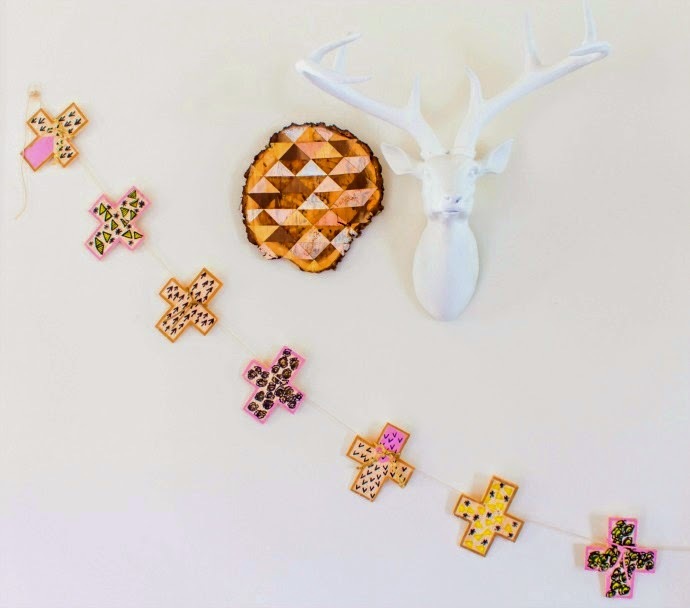 If crosses aren't your thing, please feel free to make Pineapple Bunting instead. As Martha often suggests, if we pop a little vodka in our tea cups we won't even know the difference! I too think it’s important to be flexible when it comes to a good crafting tete tete - so if you make any mistakes, remember there is always, always much beauty to be found in imperfections. No more of the "Chatty Cathy" from me – I think it’s time we got down and crafty! A cross design – you can print my cross design here. Painters tape – strong hold. Paints – I used oil paints on my bunting purely because they are my fav’s babes! I find the colour tones and clarity so beautifully addictive but you can totally use acrylics or even ink pens or texta's. However you decide to colour your crosses, is perfectly ok by me! * FYI – My oil paints did not take too long to dry as I used the paint very sparingly and applied it using my fingertips. Prepare your mat and crafting station with all of the requirements listed above. 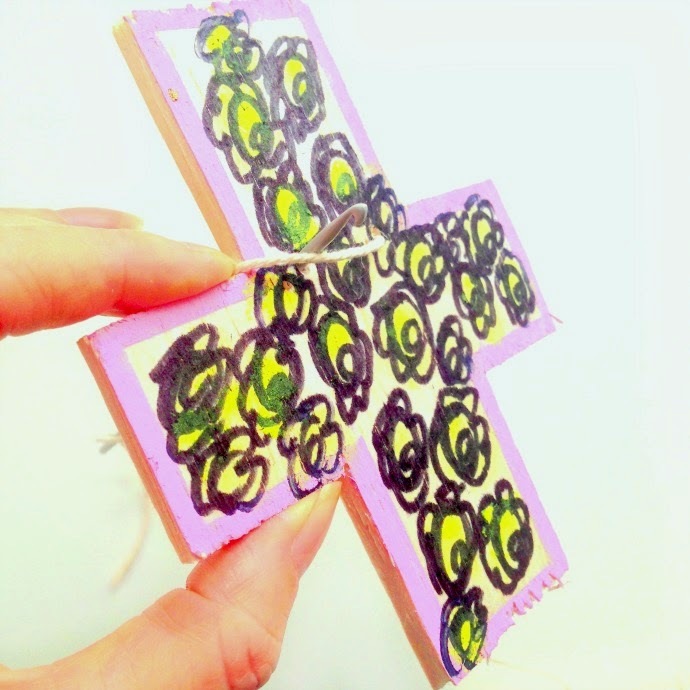 Print out your cross design / pdf – using scissors cut around your cross shape. 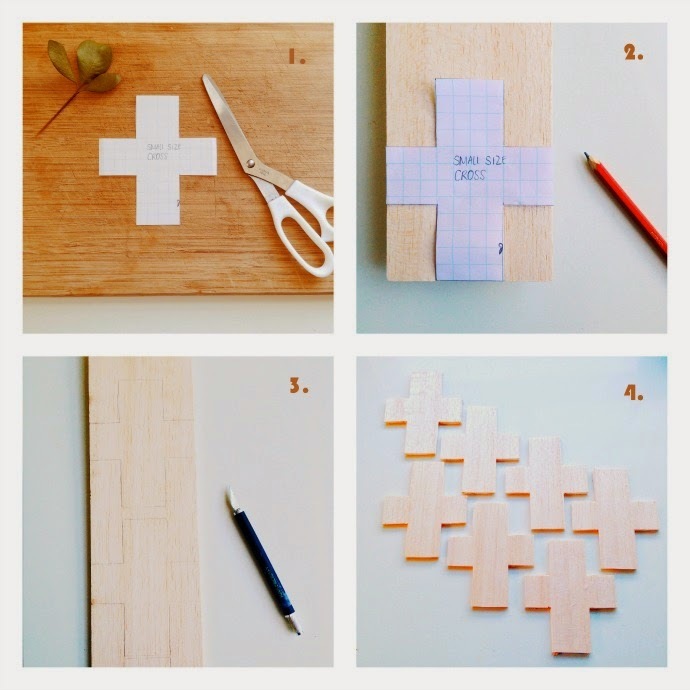 Using your cutting mat, place your cross over your balsa wood and lightly trace around the design with a pencil. Remove the cross design and cut around your sketch using a Stanley knife or blade. * It is best to always work your knife in a downwards direction so that you have more control – swivel the cross shape around until you have completely cut out your design. 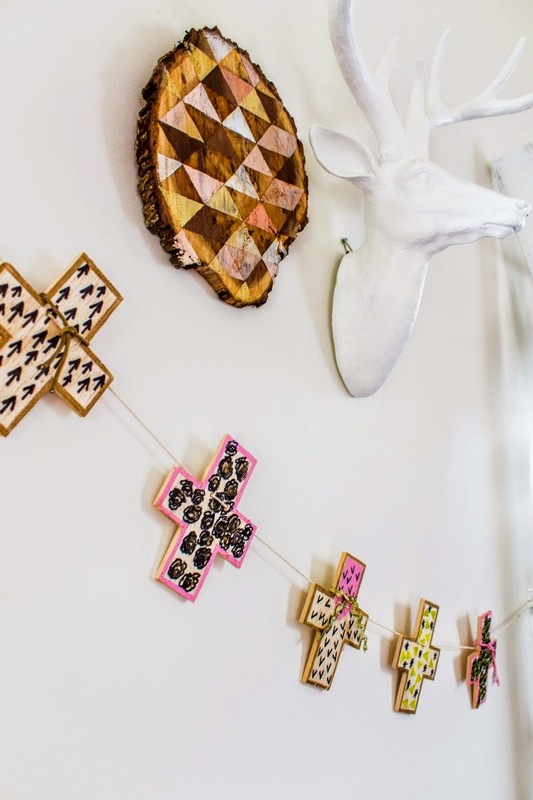 Cut out 6 or more crosses however cross numbers simply depend on how long you want your bunting to be. Firstly choose a colour palate or mood for your bunting design – pick at least three fabulous tones that work a little colour- magic together. Perhaps your palate could be based on nature, your favourite colours or a scheme that you’ve already established at your home already?? 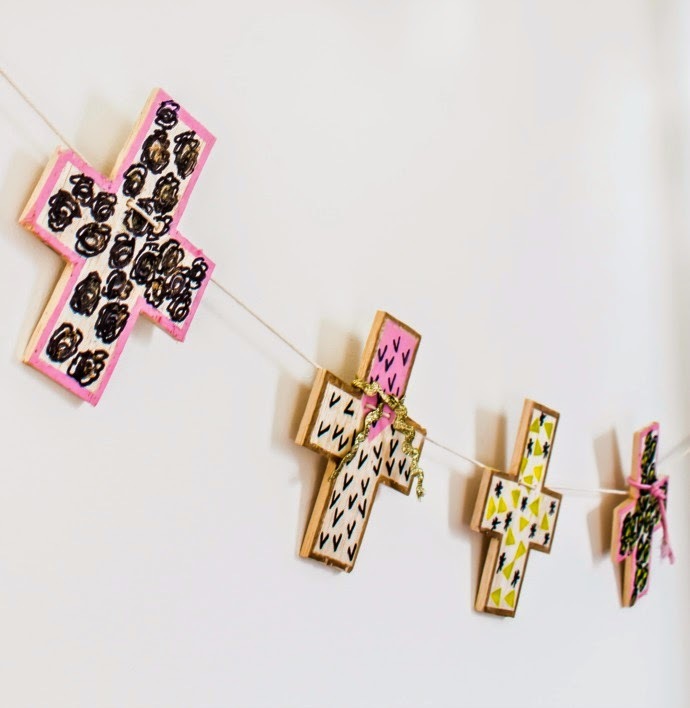 * If you’re needing inspiration – I painted my crosses in pink, gold and variations of yellow tones. Yes I did chose a “safety yellow” shade in order to channel a lil Martha into my crafting room – I know it’s one of her faves! Using your Painters tape – create /isolate some shapes to be painted * I used triangle shapes, I hand drew arrows and flowers. This is basically where you have a swig, oops I mean sip of tea and let your creativity shine how you want it to. Using an embroidery or crochet needle gently make two holes on each cross as pictured. FYI - you don't want to place your holes too low down sweets as your cross will then have trouble staying upright. Using your crochet hook, grab your twine and thread it through each cross. 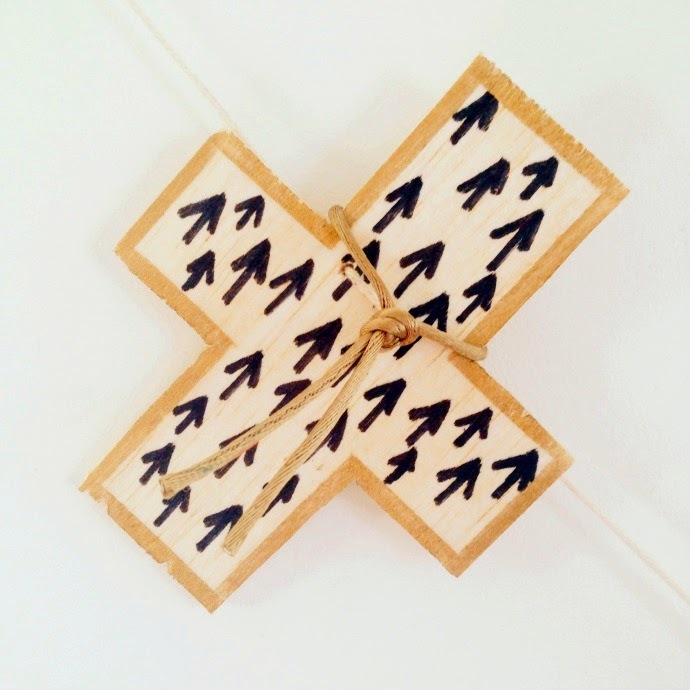 You can hang your cross bunting vertically or horizontally in any space. * I think it would look super great layered over windows/ curtains, on a Christmas tree or mantle or as part of a wall vignette. 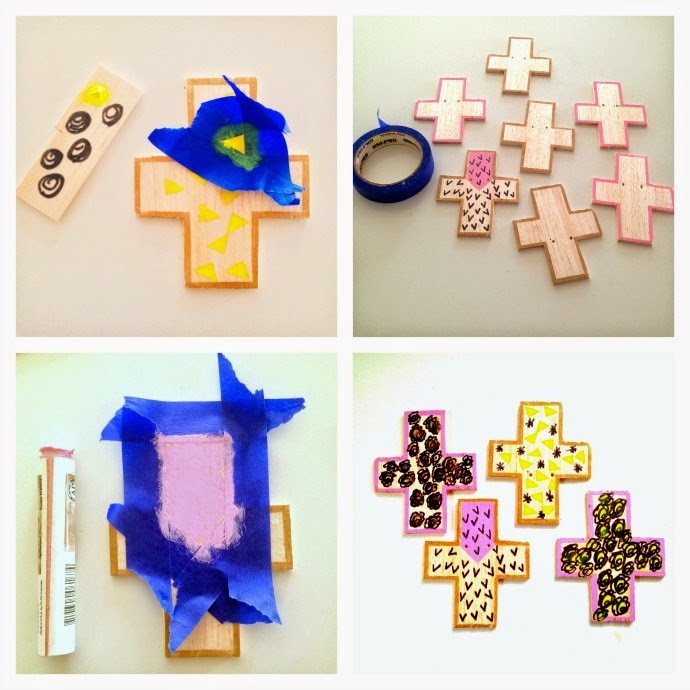 Thankyou for having me guest here Martha, do hope you all have enjoyed making your crosses! I am so looking forward to hearing all about Martha's adventures in Dubai, I simply can’t wait, can you?